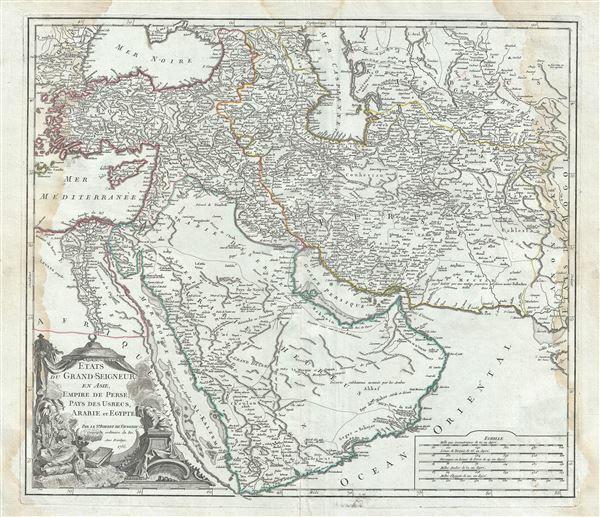 This is Robert de Vaugondy's spectacular 1753 map of the Persia, Arabia and Turkey or the Ottoman Empire. Vaugondy maps the Empire at its height, with territory spanning from the Black Sea to the southernmost extension of Arabia and west, inclusive of Persia, as far as the Mongol Empire of India. Includes the modern day nations of Turkey, Egypt, Saudi Arabia, Oman, Yemen, the United Arab Emirates, Iran, Iraq, Kuwait, Israel, Palestine, Jordan, Syria, Lebanon, Armenia, Azerbaijan, Georgia, and parts of Afghanistan, Pakistan, India, Uzbekistan, and Greece. Vaugondy employs all of the latest geographical information of the time incorporating both French and transliterations Arabic place names. This map offers splendid detail throughout inclusive of undersea shoals and reefs in the Red Sea and Persian Gulf, mountain ranges, lakes, rivers, and historical sites. A highly decorative title cartouche showing an Ottoman prince appears in the lower left quadrant. Five distance scales are in the lower right. This map was drawn by Robert de Vaugondy in 1750 and published in the 1757 issue of his Atlas Universal. The Atlas Universal was one of the first atlases based upon actual surveys. Therefore, this map is highly accurate (for the period) and has most contemporary town names correct. Very good. Minor wear and verso repair along original centerfold. Original platemark visible. Minor spotting and offsetting with damp stains near borders. Rumsey 3353.091. Pedley, Mary Sponberg Belle et Utile: The Work of the Robert de Vaugondy Family of Mapmakers, 389. Alai, C., General Maps of Persia 1477-1925, E. 118, Pl. 78.